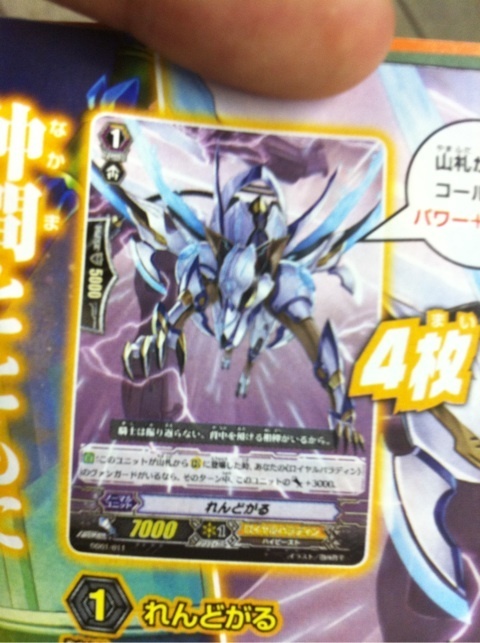 [CONT] Limit Break 4 (This ability is active if you have four or more damage):During your turn, if you have face up card named « Solidify Celestial, Zerachiel » in your damage zone, all of your units with ‘Celestial’ in its card name get [Power]+3000. 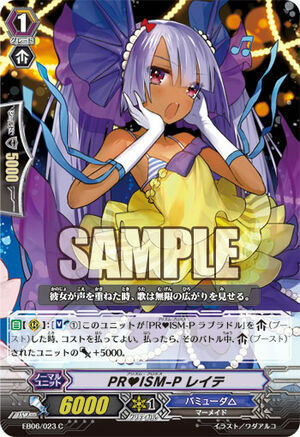 [ACT](VC):[Counter Blast (2) – Cards with « Celestial » in its card name] This unit gets [Power]+5000 until end of turn. The commanding officer/captain of the Special Medical Team « Lapis Lazuli Celestial » whose members are marked by their blue wings. She hides her six wings in times of peace because they intimidate patients. A gentle, broad-minded woman, she possesses both high levels of leadership and calm judgment that she gained during her time in the garrison, and as a result, she is fully trusted by her team due to both her personality and abilities. She’s often seen yelling at her rash vice-captain « Ramiel » who is prone to leaping into things without looking, which her team cites « That behavior is exactly why I have confidence in our captain. ». She’s the fair-minded Celestial who stands at the top of the Lapis Lazuli Celestials. It’s said that only love and kindness exist in her deep blue eyes that are the same deep blue as her wings. A Special Medical Team in « Angel Feather » whose members are deeply committed to their work and must have the skills to match that commitment. Those that pass the aptitude test and want to be assigned must discard their old wings during their baptism by the Archangels, gaining new « Lapis Lazuli Wings ». They are sometimes known as the « Reckless Saviors » due to their intense sense of duty that is both inspiring and terrifying. 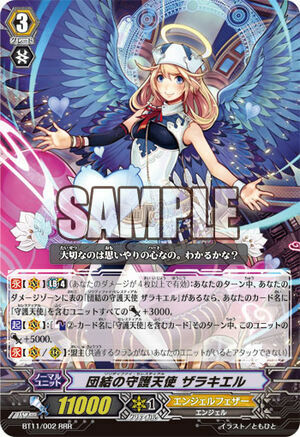 [AUTO]:[Counter Blast (1)] When this unit is placed on (RC), if you have a «Angel Feather» vanguard, you may pay the cost. If you do, search your deck for up to one «Angel Feather», put it into your damage zone, shuffle your deck, and choose one face up card from your damage zone, and put it into your drop zone. A member of the Special Medical Team « Lapis Lazuli Celestial » whose members are marked by their blue wings. She possesses access to an Administrator only Magical Device, « The Candle » that is incapable of going out unless the controller wishes it to, which is capable removing fear and anxiety from anyone who sees it. She always carries a small candlestick with a bit of flame borrowed from the original « Candle », so that when the troops are dispatched to a location, she can show patients the flame, lending its divine protection to them. It’s a tiny light that no matter when, makes sure hope carries on and keeps despair at bay. Those drawn to the flame gather and respond by turning it into an enormous flame by walking the same path together. The little hope she brings to those she visits becomes a blazing bonfire that leads them to even greater hopes and dreams. 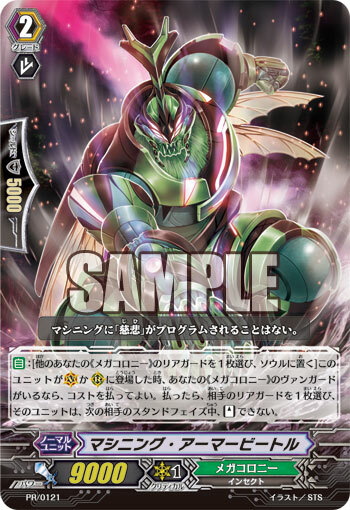 [AUTO]:[Choose another of your «Megacolony» rear-guards, and put it into your soul] When this unit is placed on (VC) or (RC), if you have a «Megacolony» vanguard, you may pay the cost. If you do, choose one of your opponent’s rear-guards, and that unit cannot [Stand] during your opponent’s next stand phase. A new model of Machine Insect who has had its emotional programming amplify the emotions of brutality and of being strong. Its concept is that of a long-lasting soldier that rampages through the enemy and their bases for the sole purpose of creating unnatural mass confusion and mayhem. Because its already hard exoskeleton has been reinforced with even stronger armor, it is even sturdier than any of the small Machine Insects. Also, even if its limbs and head are detached from its main body, they can act independently for at least an hour. Machining Insects are mechanical soldiers that surpass other machines. However, since it’s just a machine, actions other than what it has been programmed to do never occur to it. Bribing and begging with it are meaningless. Should you come across it, it’ll attack you without question, so the only way to win is to completely destroy it. There is no other way to survive. The generic term for mechanical insects created by the scientists of the criminal organization « Megacolony » by enhancing and improving their fellow insects through super science. Many of those who have been subjected to the surgical enhancements have had their destructive tendencies amplified, and many are recorded to have far more aggressive and destructive personalities than before. Because the research subjects after the first batch are heavily controlled and monitored, what kind of research and studies are done now are completely unknown. 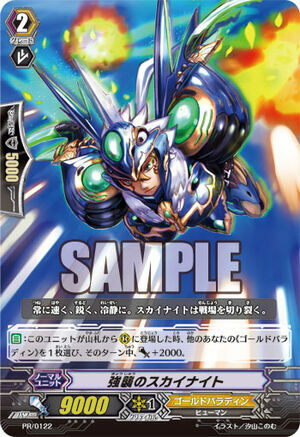 [AUTO](VC/RC):[Counter Blast (2)] When this unit attacks, if you have a «Genesis» vanguard, you may pay the cost. If you do, this unit get [Power]+5000 until end of that battle. A witch of « Genesis » who controls the « Crimson Water ». The « Crimson Water » she uses is a sacred magical water only Crimson Sorcerers can make. These alchemists are capable of transforming anything in nature via special methods and intense focus and prayer. Because the amount of magic required to maintain the transformation of more complex materials increases with the complexity, this power isn’t very useful for transforming solids, but combined with magic of the four elements (Wind, Water, Earth and Fire), it can be used to show almost omnipotent offense and defense. She is particularly good at combat that includes Fire Magic, often using the « Crimson Water » as a catalyst for her bigger spells. No two Crimson Sorcerers can use it the same way, but it’s said that even a small vial of this water is so volatile that it can burn an entire mountain clean, making it extremely useful. – Chaque carte est imprimée dans une rareté RRR, à l’exception de 12 cartes SP. 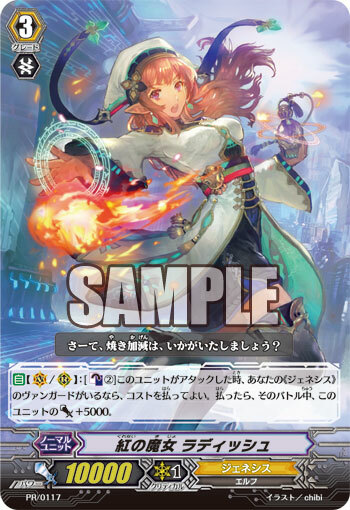 [AUTO](VC):[Counter Blast (1) – Cards with « Eradicator » in its card name] When this unit’s attack hits a vanguard, you may pay the cost. If you do, your opponent chooses one of his or her rear-guards, and retires it. An Eradicator of Narukami whose silhouette looks like he’s covered in blades. His entire body is filled with organs that store and release electricity, the effects of which have been pushed to the limits via new kinds of surgical equipment and arms. He stores lightning via the horns and spikes all over his armor, and releases all of the absorbed energy at once through the horn at the top of their head. « Radiate Spark » is a technique that launches a super vast wave of lightning from itself that only Thunder Dragons and the warriors of « Narukami » can resist, any one other than them will fall flat to the ground and lose control of their bodies. Changing the swirling thunderclouds and distant thunder and lightning into its own power via its crimson thunder horns, it strikes down all those who exist that do not love thunder and lightning. A knight of the Azure Falcon Corps of the Gold Paladins that specializes in aerial combat. It’s said the « Energy Booster » he wears is a simplified model of the « Aura Booster » developed by the « White Hare Corps », and has been decided to be a mass-produced piece of equipment for the Azure Falcon Corps. The output is inferior to the original model, but maneuverability has been incredibly improved, and it’s said those who can use it best are knights who have been using it since the beginning. It is said the jet trails of their booster shines like azure and that when they fly across the sky in unison, it looks like a meteor shower. A flock of Azure Falcons is quicker and more agile than anything else the sky, cutting across the sky and battlefield. They cut through to pave the way for their allies to follow. One of the 7 divisions of the Gold Paladins that use one of the Seven Sacred Beasts that protect the Sanctuary as their emblem and symbol. The Azure Falcon Corps is the only Corps that specializes in aerial combat, including dogfights. By lowering their defenses, they have specialized in the areas of speed and attack. Bonjour à tous ! La déferlante du mois est un cataclysme de feu ! Faites place aux Seal Dragons ! Hello everyone ! Today’s storm is a fire cataclysm ! Behold before the Seal Dragons ! [AUTO]:[Counter Blast (2)] When this unit is placed on (VC), you may pay the cost. If you do, choose an opponent’s rear-guard, and retire it. 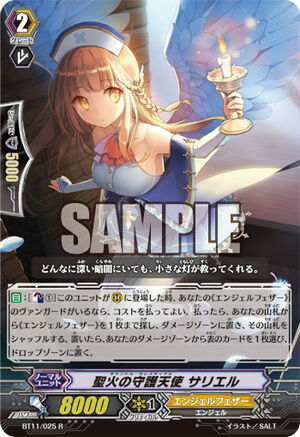 [AUTO]:[Counter Blast (2)] When this unit is placed on (RC), if you have a «Royal Paladin» vanguard, you may pay the cost. If you do, choose an opponent’s grade 2 or greater rear-guard, and retire it. 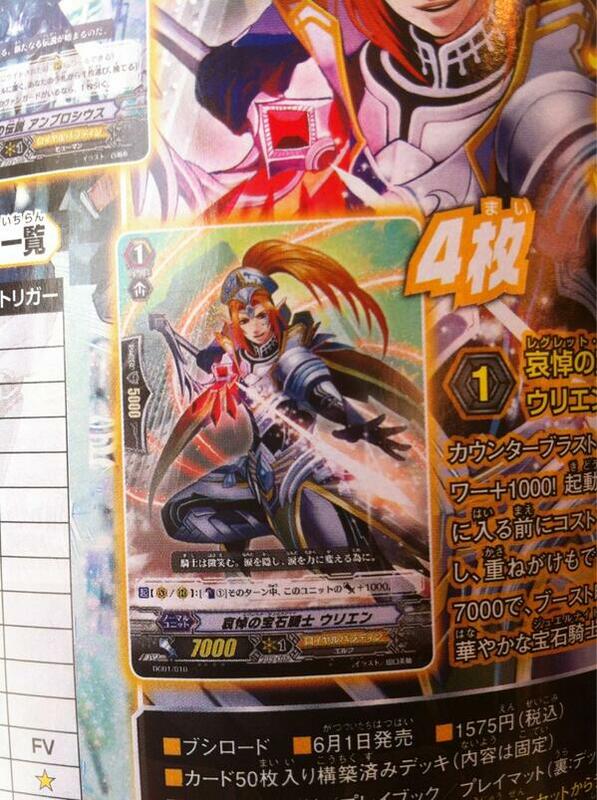 [AUTO](RC):When this unit boosts a card named « Blaster Blade », the boosted unit gets [Power]+4000 until end of that battle. [AUTO](VC/RC): [Soul Blast (1)] When this Unit attacks, and you have a « Kagero » Vanguard, you may pay the cost. If so, during that turn, this Unit gains +3000 Power. 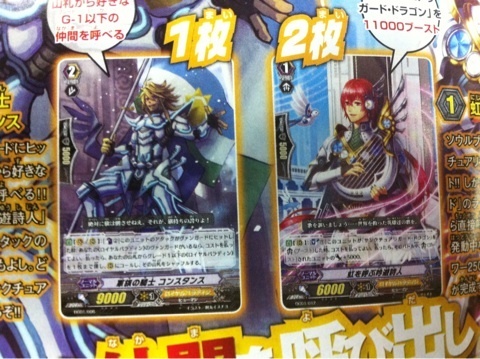 [AUTO](VC/RC): [Soul Blast (1)] When this Unit attacks, and you have a « Royal Paladin » Vanguard, you may pay the cost. If so, during that turn, this Unit gains +3000 Power. 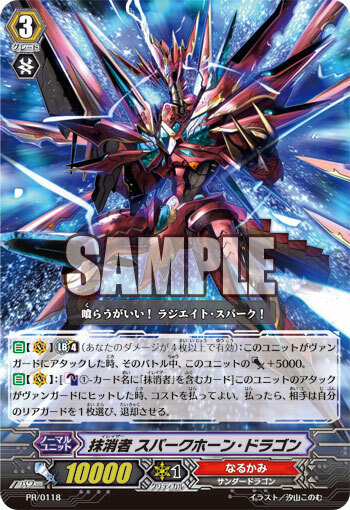 AUTO: When this unit is placed on Vanguard Circle, choose up to one card named « Blaster Blade » from your soul, and call it to Rear-guard Circle. 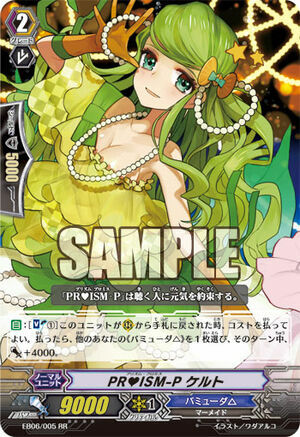 [AUTO](VC) Limit Break 4 (This ability is active if you have four or more damage):When this unit attacks a vanguard, choose up to three cards with « PR♥ISM » in its card name from your hand, you may call them to separate open (RC), and if three cards were called, this unit gets [Power]+10000/[Critical]+1 until end of that battle. 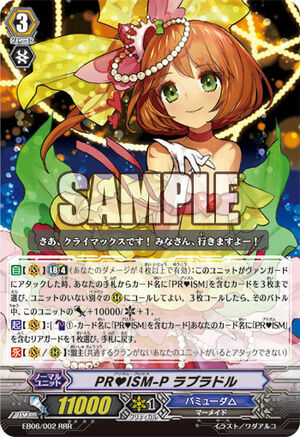 [AUTO](RC):[Soul Blast (1)] When this unit boosts a unit named PR♥ISM-P Labrador, you may pay the cost. If you do, the boosted unit gets [Power]+5000 until end of that battle. A part of the Idol Group « PR♥ISM », of the five teams, PR♥ISM-Promise happens to be the rising stars garnering attention. There’s Celt who is an extraordinary actor, Labrador who’s the charismatic and extremely pretty leader, and Leyte whose voices spreads like a wave. Due to the incredible potential of each member, they’re a team who can go above and beyond the call of what’s expected, no matter the genre of work. Initially the extremely prideful Leyte was incapable of working with her team, that resulted in a crisis that would of dissolved them, but she ultimately reconciled with the others due to a certain event. Due to coming together, Team Promise’s popularity has continued to rise unopposed, resulting in them winning the title of PR♥ISM No.1. During an event Promise is at, Labrador always recites the following message. She always says them with a smile, as the audience smiles back at her. One of the Groups that the Idols of « Bermuda △ » belong to. Considered an oddity for being a 16 member Super Group, its founding is considered a topic of discussion. The group consists of 5 Teams: Promise, Romance, Image, Smile and Miracle. It is said that the group’s name is PR♥ISM because when the group was conceived at the time of auditions, the premise was « Shining with every possibility ».